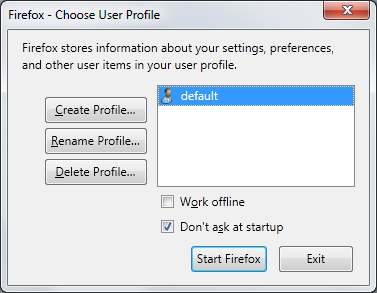 The Firefox Profile Manager allows you to create an additional profile while retaining your original one. This is useful not only for having separate settings for multiple users, but also for troubleshooting (see Note, below) . You should NOT delete any existing profile unless you are absolutely sure that you will never need it again. If in any doubt, then please leave alone. You can then use your newly created additional profile just as it is, import bookmarks to it immediately or transfer some/all of your original settings over to it. All while still be able to go straight back to your original profile. It is suggested that you back up or export bookmarks from your old profile now, as a precaution, before moving on to the following stages. If Firefox is open, close it completely by choosing "File -> Exit". Enter firefox.exe -P (i.e., firefox dot exe space hyphen P) and then click OK.
Click the 'Create Profile...' button on the 'Firefox - Choose User Profile' window that comes up. 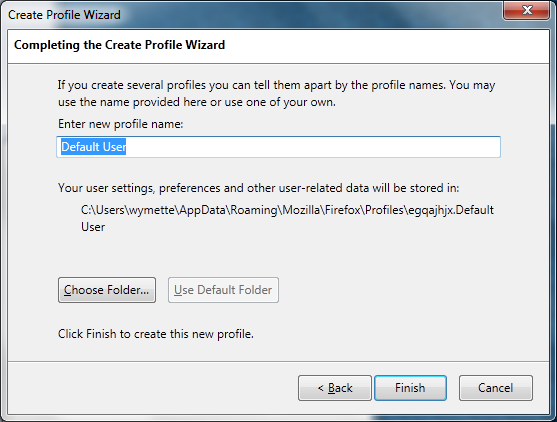 Click 'Next >' in the 'Create Profile Wizard' window that comes up. Type in a new name in the 'Enter new profile name' box and click 'Finish'. Caution: DO NOT click the "Choose Folder..." button unless you've read the warnings given under Custom profile location for Firefox. Clear the "Don't ask at startup" box so that it is unchecked (you can change this later) and click the 'Start Firefox' box. Firefox will start with the new profile. 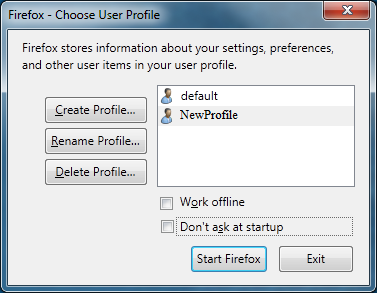 The 'Firefox - Choose User Profile' window will now appear whenever you start Firefox. 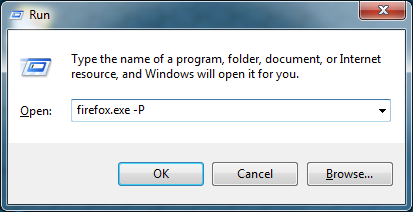 If you decide that you no longer want to see this window, check the 'Don't ask at startup' box the next time it appears. 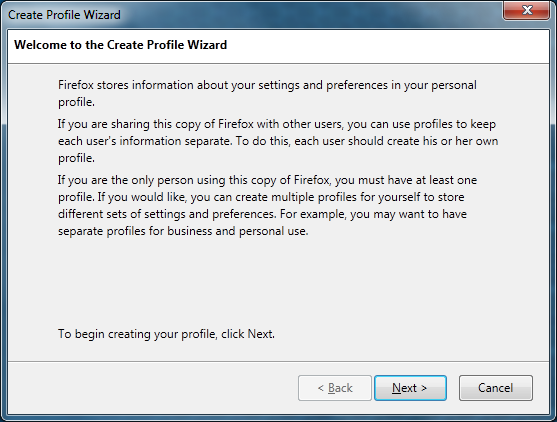 The last selected profile will then start automatically when you next start Firefox and you will need to start the Profile Manager again to switch profiles. Note: If you are creating a new profile for troubleshooting purposes then do not install any extensions or themes to it. Also, be aware that some extensions are installed globally (e.g., for all profiles) and you will need to disable those in the Add-ons Manager.